← Spiced Walnuts…and PLEASE vote for me! I love dishes that can be served any time of day. I think Rachael Ray has some sort of term for them, but no need to go there. You get what I’m saying. How much easier could this possibly be? Perfect for an intimate breakfast, double/triple it for a large brunch crowd, or serve it as a simple dinner. Adding meat to this would make it even heartier, but it was delicious just the way you see it. Either way, I encourage you to try it this weekend. Enjoy! And please, vote for my Pasta e Fagioli if you haven’t already! THANK YOU!! Preheat oven to 400 degrees. Melt butter in a cast iron skillet (or, as seen in photo, in dutch oven for larger quantities) over medium heat. Add potatoes and cook until tender and brown, about 15 minutes. Stir in parsley, garlic, salt and pepper, then remove from heat. Push potatoes aside to make 4 pockets for eggs, and break 2 into each. Bake until egg whites are cooked and yolks are still runny, about 10 minutes. Sprinkle cheese over eggs and bake another minute or two until cheese melts. Serve immediately. 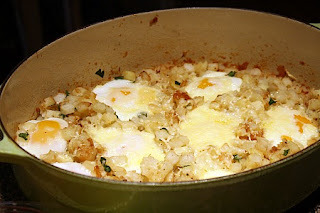 This entry was posted in breakfast, cheddar, eggs, potatoes, QuickAndEasy. Bookmark the permalink. My stomach is growling just looking at this. Yum! Yum! I love eggs and potatoes for breakfast. This would be great as a breakfast-for-dinner too. This is such a yummy one…I would love to try it..U have made perfectly Dear..Bookmarking it.. I love baked eggs on top of anything. I have p ut it on mac and cheese. Ok, this was soo good! I added in 6 slices of crumbled bacon and I’m in heaven! Mmmm….